The art of packing light is obviously not something that I have mastered and with all the travelling that I have done for work firstly as a model and then as an artist and just for pleasure that’s a real shame. I always find that I need whatever it was that got eliminated from the suitcase, so instead I carry everything but the kitchen sink around with me and get held up at Customs & Security at every airport for some reason or another! As you can hear we have just come home from another trip, this time to Europe for 5 weeks and what a fantastic time it was too. Hubby did all the coordinating and organizing over the net with hotels, planes, cars, pickups and trains which worked a treat. We arrived in London where after some sightseeing caught a flight to Gothenburg, Sweden (3 nights), Sundsvall, Sweden (2 nights), Stockholm (4 nights), Katowice, Poland (2 nights), Prague, Czech Republic (4 nights), Budapest, Hungary (3 nights), Zagreb, Croatia (1 night) Dubrovnik (3 nights), Venice (2 nights) Amalfi coast (7 nights), Paris (3 nights) and then back to London before the 30 hour flight home again. 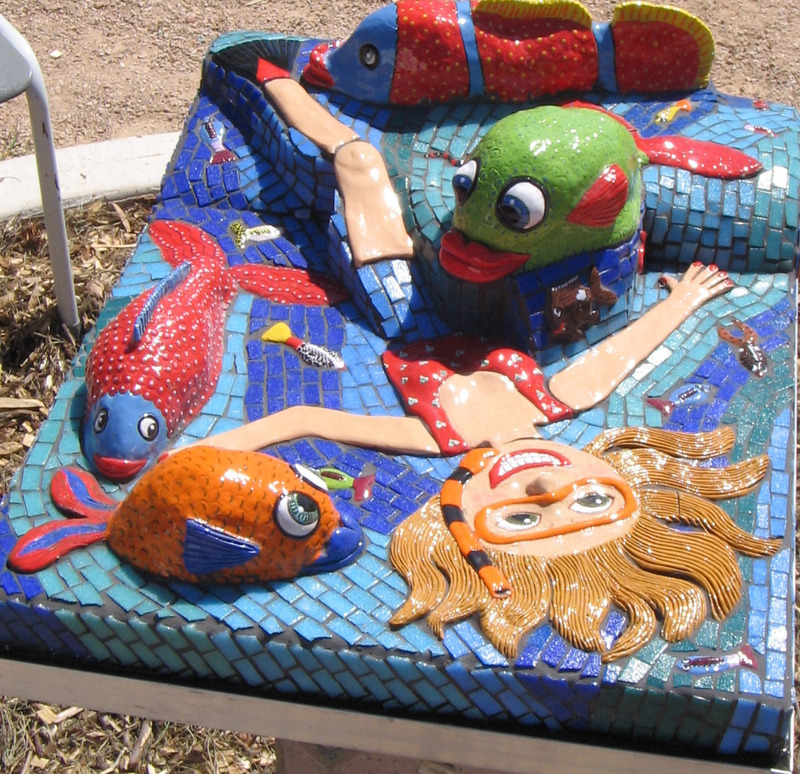 Of course there are lots of travelling tales and inspirations for future paintings and art blogs to come but what I will start with today is the reason we undertook this trip in the first place. 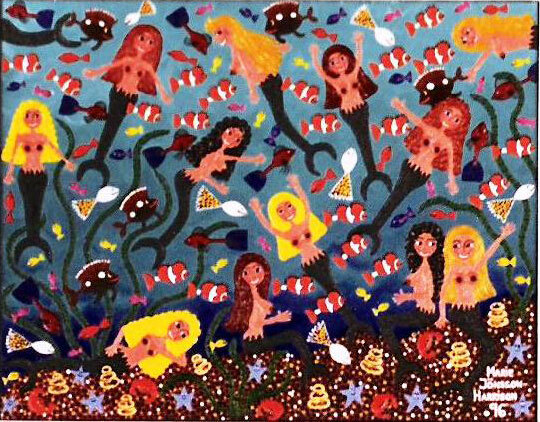 This Mermaid painting sold in Japan but I think the inspiration comes from under the sea by Hotel Onda Verde, on the Amalfi coast. Our good friend Robert had decided that Italy may be a great spot to celebrate “that” big birthday in. His lovely wife Christina’s family comes from there so they wanted to share this wonderful country with the rest of us. That’s how come 11 people from Australia found ourselves at the stunning hotel Onda Verde situated in between Positano and Amalfi at Praiano, a hotel fashioned into the side of a cliff overlooking the blue, blue Mediterranean sea. Not just any hotel mind you but one where the owners, staff, rooms, ambiance, food & drinks were second to none – just ask Pierce Brosnan or Jessica Alba, as they stayed there too just recently! As if that wasn’t perfect enough we then had the good fortune of having a group who just fitted together like a glove. All the elements were there; we had Judy who supplied the guts and hutzpa, her husband Jeff gave us irresistible one liners, Coralie sorted out any kinks in the tour/gratuities arrangements and Emma was the expert tour guide with her knowledge on everything Italian whilst her boyfriend Paul keep us amused with funny stories (my cheeks still hurt from laughing). Carol added sensibility & practical advice and her hubby Graham was the thoughtful one (he saved me from swimming all the way to Capri) Husband Bryan was the steadying hand as always whilst Christina and Robert the perfect hosts, showing us “their” Italy on tours & boats and treating us to drinks and long lunches. 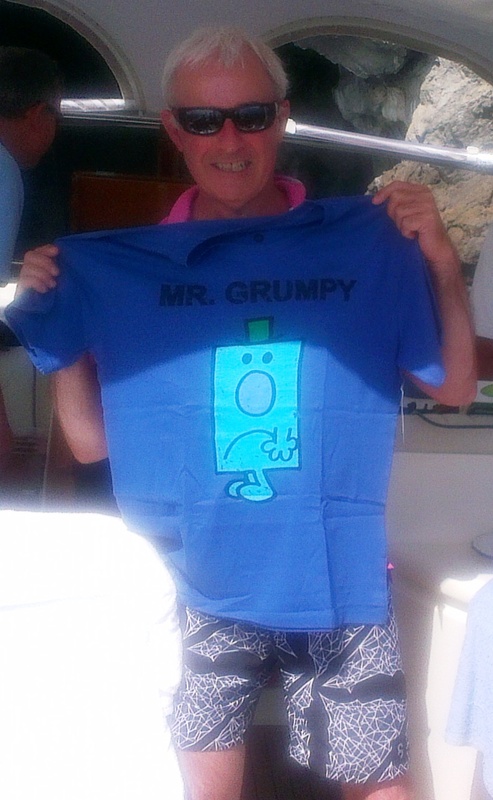 The usual Mr Grumpy was nowhere to be found and in his place was Mr Perfect and clearly I bought the birthday boy the wrong T-shirt as the photo shows! Oh and I’m not sure what I added to the group but I like to think it was a touch of enthusiasm for life! I think perhaps all of us fell a little in love with Italy and everything Italian- their passion, the language, scenery, people, wine & Limoncello and the food. I always thought the way to a man’s heart was through his stomach but go figure it works just the same on a woman, lol. My mantra has always been; “Just because I am on a diet, doesn’t mean I cannot look at the menu, right?” Yes and look I did, well what’s a hot-blooded girl to do when the “chef extraordinaire” says he is making love to you with his eyes and through his food, bringing out dish after dish and then watches every bite you take…. Till next time, happy painting and sculpting!